Kenya’s camels recently started sporting some unusual apparel: eco-friendly refrigerators! Some of the African country’s camels are carrying the solar-powered mini fridges on their backs as part of a test project that uses camels as mobile health clinics. Organizers hope the eco-friendly transport system will provide a cheap, reliable way of getting much-needed medicines and vaccines to rural communities in Kenya and Ethiopia. For the past decade, Nomadic Communities Trust has been using camels as mobile health clinics in Kenya’s Laikipia and Samburu districts, isolated areas with few roadways. While the camel convoys provide a cost-effective method of traversing the harsh terrain, the group had no way of delivering medicines and vaccines that required refrigeration — until now. In 2005, Nomadic Communities Trust partnered with California’s Art Center College of Design’s Designmatters and Princeton’s Institute for the Science and Technology of Materials (PRISM). 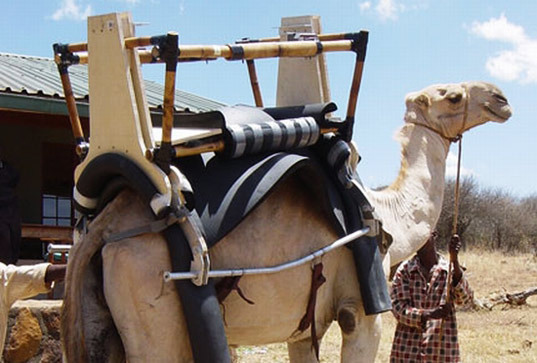 Together, the groups created a lightweight and durable solar-powered refrigerator that can be strapped to camels’ backs in order to transport chilled medicines and vaccines. 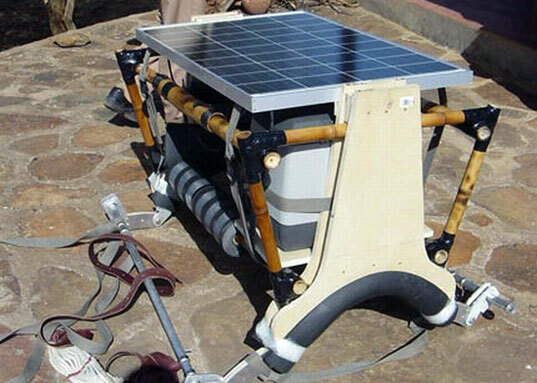 The mini fridge is housed in a bamboo saddle that is lightweight and durable enough for camels to easily carry it across miles of rough terrain. The device itself is covered with crystalline solar panels that provide power for the compartmented fridge’s generator. The solar panels themselves can also be used by the mobile clinics for lighting and refrigeration in the field. Mariana Amatullo, Designmatters‘ executive director, said the project was designed with a budget of only a few thousand dollars. 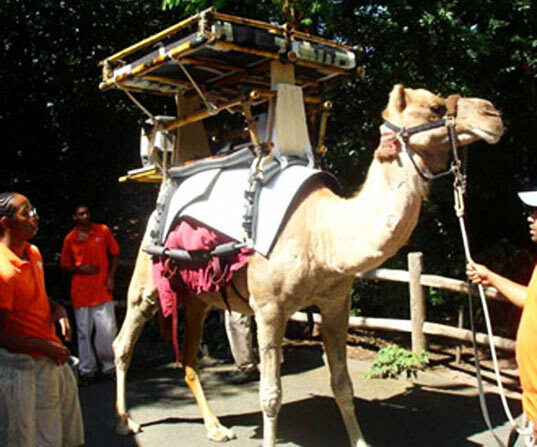 To save money, designers tested the device on the Bronx Zoo’s camels so people wouldn’t have to fly back and forth to Kenya. The solar-powered fridges are currently being tested on camels in Kenya and Ethiopia, but Amatullo says the system could be used by any rural communities with access to camels. If the project secures enough funding, it will be implemented in earnest in 2010. Let’s hope the eco-friendly venture receives the money it needs — in the Laikipia and Samburu districts alone, 300,000 people do not have access to the mobile health clinics. great idea to use both solar panels and camels! Hello, my friend working at Japanese TV broadcasting company wants to have an interview about this article. How can we contact Inhabitat members? Camels might be considered invasive creatures destroying the countryside and intimidating the locals in Australia, but in Africa these nomadic animals are seen in a much more positive light. For years, organizations such as the Nomadic Communities Trust (NCT) have relied on camels to transport medicine and supplies to remote locales. And now the camels are going solar. NCT, in partnership with Princeton University and The Art College of Design in California, have created solar-powered mini-fridges that strap to the camel’s back. Featuring an ergonomic bamboo saddle, folding solar panels and a foot powered backup system, these solar powered mini-fridges can store vaccines and other medicines desperately needed in remote areas located off the power grid. Once in the field, the solar panels will used not only to power the refrigeration systems but also to provide light at mobile clinic locations. Currently being tested in Ethiopia and Kenya, it is hoped that these eco-friendly, camel-friendly solar powered mini-fridges will be in widespread use by 2010.
ingenious. it makes me smile! Wow, that's not something you see every day. Great use of solar panels. Kenya's camels recently started sporting some unusual apparel: eco-friendly refrigerators! Some of the African country's camels are carrying the solar-powered mini fridges on their backs as part of a test project that uses camels as mobile health clinics. Organizers hope the eco-friendly transport system will provide a cheap, reliable way of getting much-needed medicines and vaccines to rural communities in Kenya and Ethiopia.